The chances are that you are reading this blog post on your smartphone. Maybe relaxing in your favourite café with a delicious piece of cake and a good cup of coffee. So the fact that the number One present in this year’s Christmas stocking will most probably be a mobile device of some kind shouldn’t come as a great surprise. We are apparently spending more for gadgets nowadays without being too bothered about the price. Style, functionality and brand reputation matter more. According to Statista the number of mobile phone users in 2017 is forecast to reach 4.77 billion and pass the 5 billion mark in 2019. By 2018 over 50% of mobile phone users will be using smartphones. And in 2014 the number of all worldwide mobile devices actually overtook the number of humans on this planet! That’s a lot of phones. But what happens to these phones when they break or are just not stylish enough anymore so that their owners feel the need to be replace them with the ultimate new state-of-the-art model? Most of them lie around unused in our homes. In the UK an estimated 77 million devices and in Australia around 23 million. And in Germany a staggering 100 million! The bad news: Many are dumped into landfills instead of being recycled. In 2009 141 million mobiles were thrown away in the USA but only 12 million of these were recycled. Mobile are complex devices. Whilst the exterior is mainly made from polycarbonate, a special plastic compound, the heart of our mobile devices beats thanks to materials such as copper, gold, platinum and other precious and rare metals. 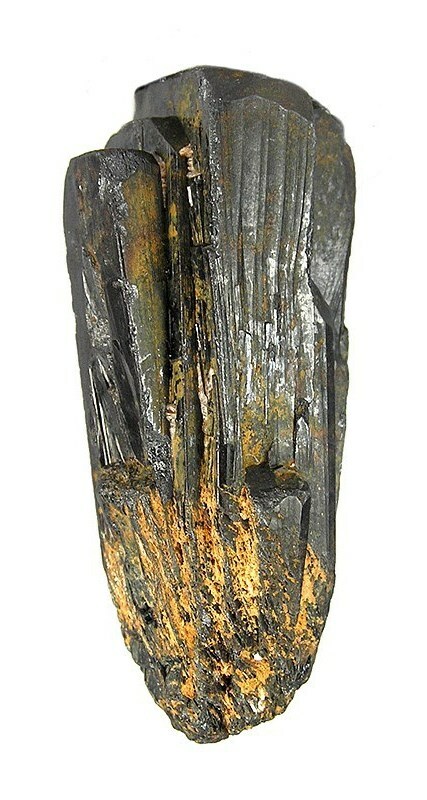 One of these rare metals is Coltan, a metallic ore from which niobium and tantalum are extracted. Coltan is found mainly in West Africa, in the Democratic Republic of Congo. The mining of this ore is not only destroying the lush rainforest of The Congo and leaving its wildlife without a home (or they are killed), but as the film “Blood Coltan” reveals the mining of this precious metal (in often illegal mines) is funding rebels and killing and enslaving the local population. Thus its reputation of being a “conflict mineral”. We are not talking modern mining technology here either as the scenes around these mines would make you think you are in the middle of the 19th century gold rush. With only 20% of the required Coltan coming from recycling and over 70% being newly mined we really need to change our consumer behaviour. The biggest question is do we really need a new mobile every two years? And if the answer is “Yes” then our “old” devices need to be recycled, refurbished or resold. They do not belong in landfills as they are toxic waste which contaminate soil and drinking water. So-called e-waste (electronic waste) is a global problem. Especially developed countries like to send their waste to less developed countries in the world who recycle by burning away the plastic to get to the metals. If you couldn’t be bothered to sell your phone on an online platform like Ebay then do consider giving it to a charity. 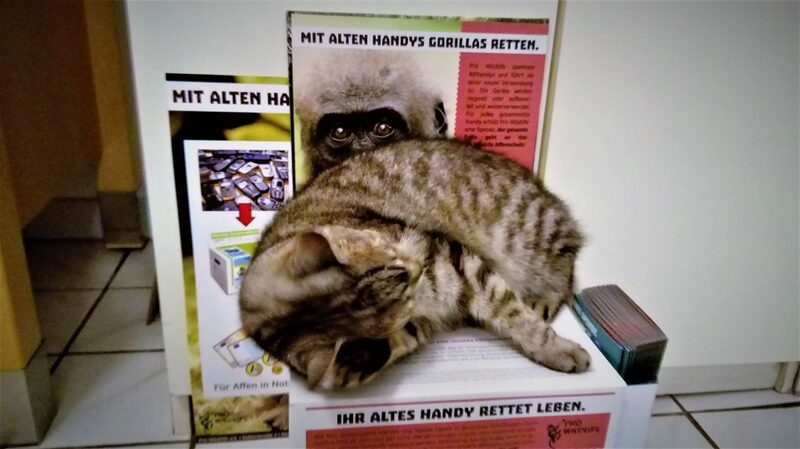 I have ordered a recycling box to support a small German wildlife conservation organisation called Pro Wildlife. For a each collected mobile Pro Wildlife receives a donation which goes towards funding their projects to help save endangered primates such as chimpanzees and gorillas. I have put the box in my office. You can also order these boxes for your local sports club or neighbourhood. Hilly, my cat, photobombing my set-up. The encouraging news is that the industry has come together and started conflict-free sourcing initiatives. But, until the time has come where the entire supply chain can be traced back to each individual mine and all mines are conflict- and child-labour free, I firmly believe that it is is our responsibility to make sure that the mobiles we don’t need anymore are recycled properly. And maybe to also think about whether having the latest smartphone really makes us a happier person. 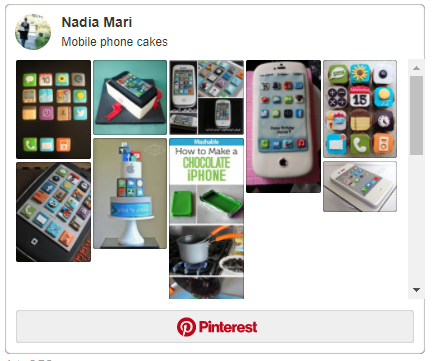 Now Cake does make me happy and I have put together a few super cool mobile phone cake ideas on Pinterest. Feel free to explore and be inspired. This entry was posted in Food for thought and tagged Environment, handys, mobile phones, smartphones, Umwelt.